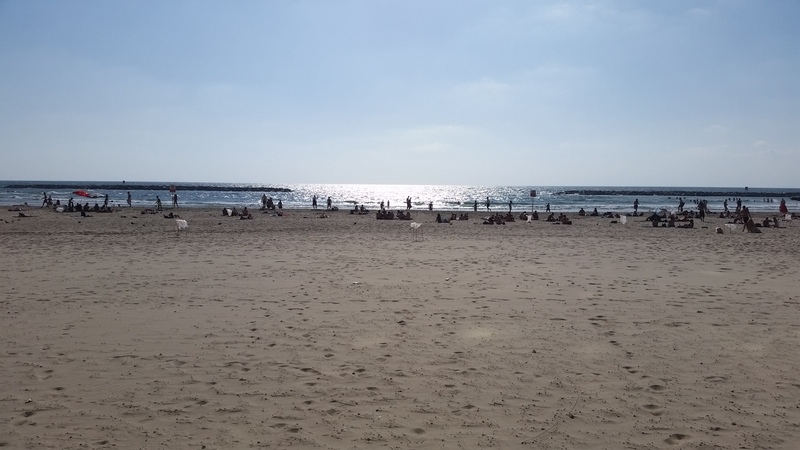 Day 11 was our last full day in Israel. We woke up around 7 for breakfast at 8 and departed afterward for volunteering. Apparently there was some complication with the planned volunteering organization, so we ended up at a different one called the Jaffa Institute which helps refugees and migrant workers below the poverty line. We volunteered packing some boxes of food staples, but the organization wasn’t really set up for the number of participants we had so it was not am efficient use of resources. Following our volunteer visit, we drove through a poorer area of southern Tel Aviv to observe the poverty situation. 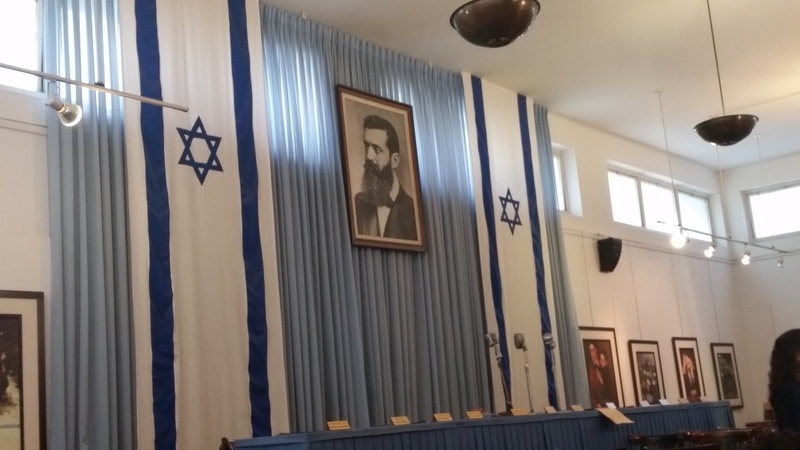 We then went to Independence Hall and learned the story of Israel beginnings. This was much the same as the last time I was in Israel. When our visit to the Independence Hall was complete, we walked to a shuk. Elan met up with me on the way, then we went for some lunch. 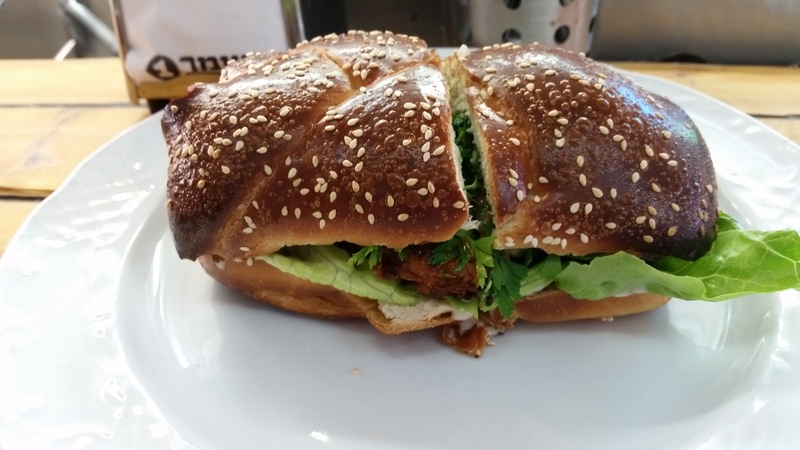 Elan took me to a place for sabeech, which was a delicious sandwich with a bunch of veggies and deep-fried eggplant. 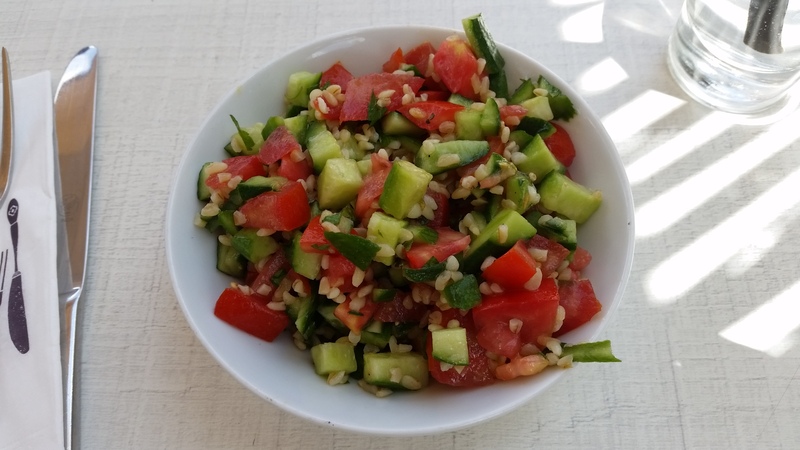 I think this might have been my favorite meal in Israel. 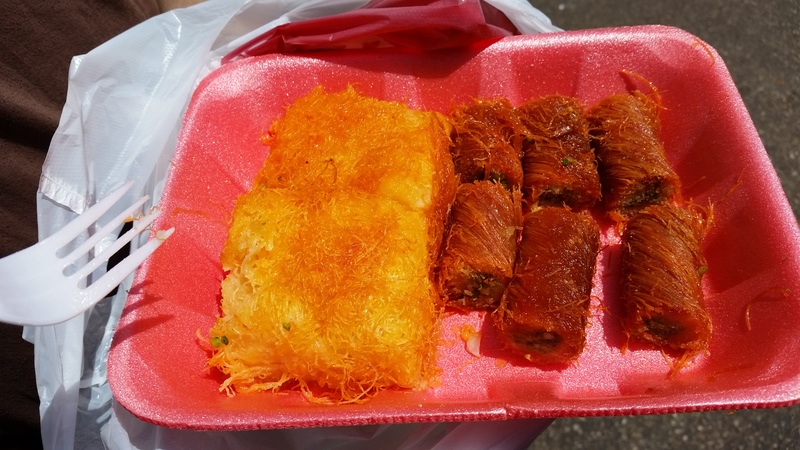 We then got some middle-eastern dairy pastry that was less good. After lunch, we went to the beach and spent a few hours in the sand and water. I got some minor stings from jellyfish, but the water was so nice it didn’t bother me. We then went back to the hotel for dinner and some closing activities. For our final activity of the night we went to walk around Tel Aviv at night. We stopped for some savory pastries and I had a calzone-like thing with salty cheese. I also finally got to have the chocolate milk in a bag that I had been wanting to have the whole trip. We’re staying up the rest of the night until we head to the airport at 2 AM. The tenth day was our last day in Jerusalem. We had a more relaxed day as it was Shabbat. Our first stop of the day was the Israel Museum. 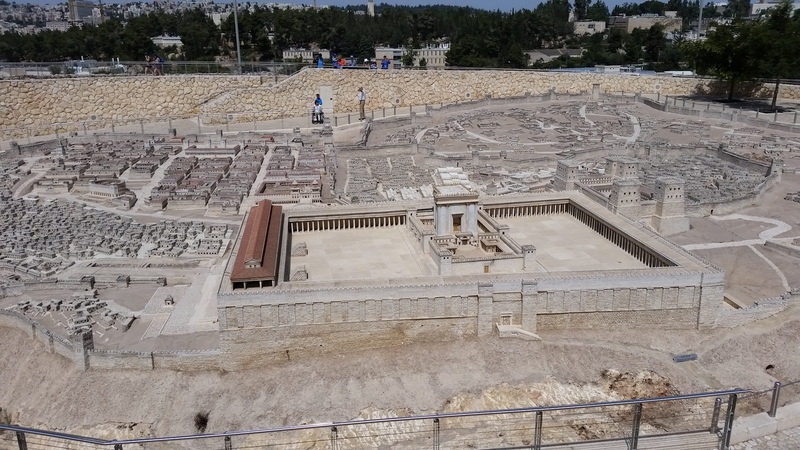 We got to see a model of ancient Jerusalem and the Dead Sea scrolls. We then had some time to explore the museum on our own. After lunch we had some free time, then got together for Torah study and a naming ceremony. It was really cool to hear people’s connections to their Hebrew names and especially for those who picked their own names. We then had time to shower and pack before dinner. After dinner we had Havdalah, and then left for Tel Aviv. In Tel Aviv we went to a bar called Dizzy. I was able to tell Elan roughly where we were, then he met me. We had a good night hanging out together. Too soon, we had to leave and go back to the hotel. Breakfast on day 9 was at 7:30, so we got to sleep a bit more than the previous day. Our first stop was Yad Vashem, the Holocaust museum. 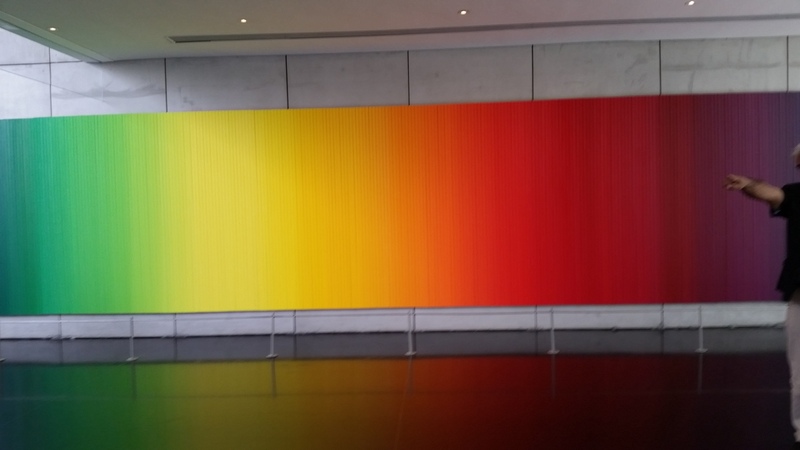 The museum was pretty powerful. I was definitely affected by images of malnourished bodies. The most meaningful part for me was the room at the end where they collect the names of as many victims as possible. After the museum we went to the shuk (market) at Machane Yehuda in Jerusalem. The shuk was really cool, much like a farmers’ market mixed with food vendors. 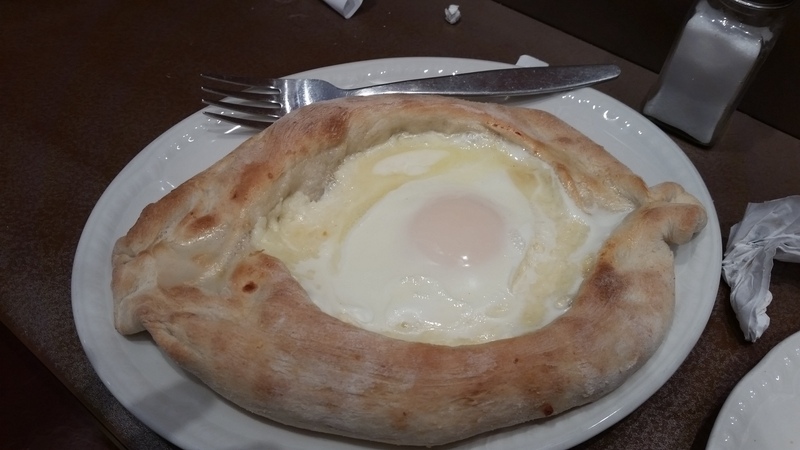 Shai recommended a Georgian place for lunch, so I went and had a delicious egg and cheese thing. Once we finished eating, we went next door for ice cream; I had saffron and basil. We then went back to the hotel for naps and showers in preparation for Shabbat. 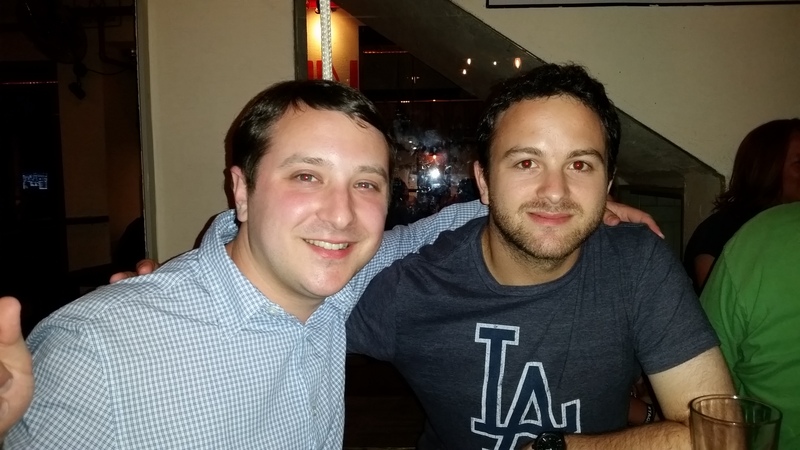 Shabbat services were led by some members of the group, then we had dinner and some drinks in the bar. At 4:00 AM, our guide Shai started playing his duck noise-maker (like the ones from the duck tour in Seattle) to wake us up for a 4:30 departure for Masada. Once we arrived at Masada we started hiking the Roman Ramp. 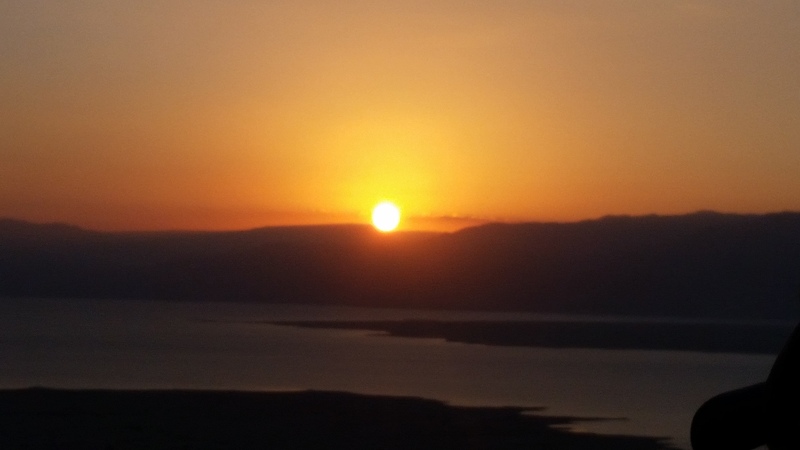 At the top of Masada, we got to watch a gorgeous sunrise. We enjoyed the sunrise, then had a history lesson on Masada. We got to go inside a huge water cistern and learned the role that food and water played in the history there. We then left for the Dead Sea. We arrived at this spa place where we were able to change and take a shuttle to the beach. A few of us explored and found a patch of mud, but later we saw this old bearded dude with much better mud all over. He invited us over, helped us put on mud, and tried to get us to visit his website. 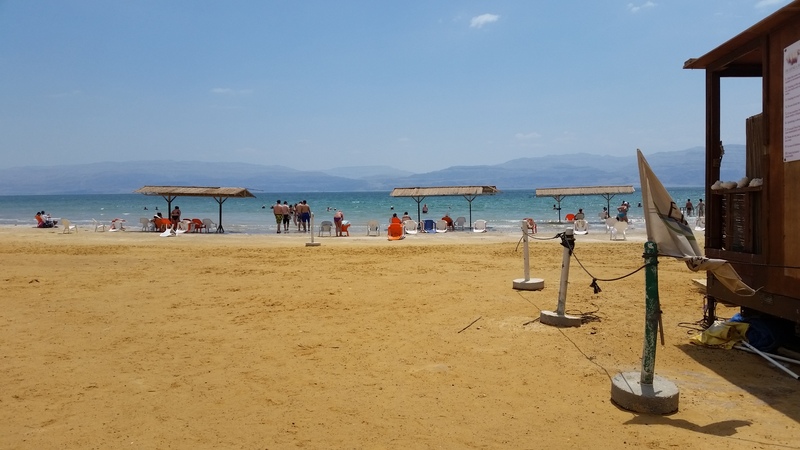 I enjoyed floating in the Dead Sea and washed all the mud off. I cut my knee open a bit on some salt and it stung, but it was a lot of fun. After the Dead Sea, we left for Jerusalem and had some free time to sleep and shower. I showered, but then spent the rest of the time playing cards. Following dinner, we had a program to explore the lives of a few holocaust survivors in preparation for our visit to the museum tomorrow (Yad Vashem). I then got some sleep on a very uncomfortable bed (just a plank of wood below a very thin mattress). This seventh day started much earlier, with a 6:30 wakeup call and 8:00 departure time. Once we got the bus loaded, we headed out to Jerusalem. 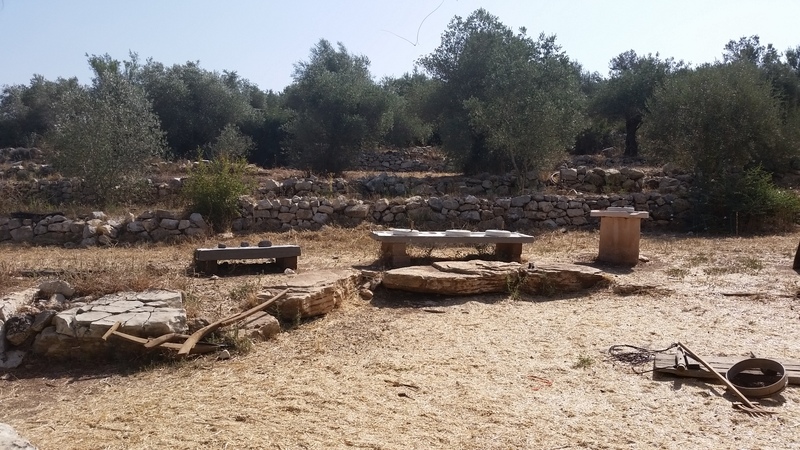 We spent some time in the old city and outskirts of the temple walls to learn about the history. 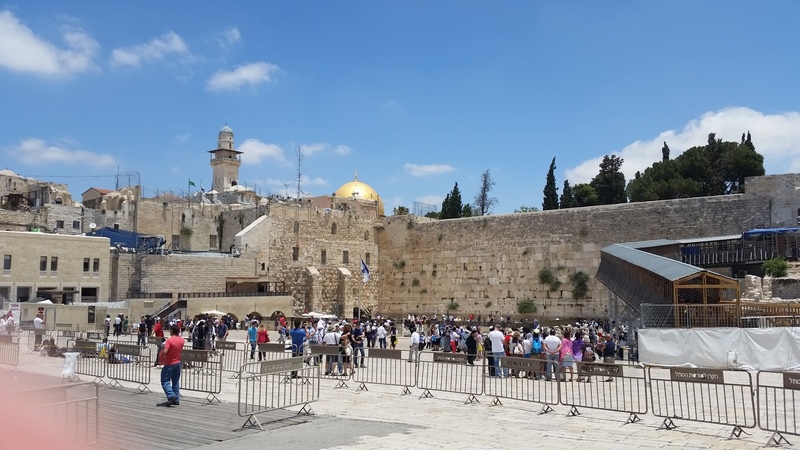 Shai then took us to a new area of the Western Wall, opened up to be a more egalitarian place for conservative and reform Jews than the main area. I really liked this area, because I dislike the separation that occurs at the Kotel (Western Wall), but there was the added benefit that it was pretty much empty except for us. We then went to the main part of the Kotel. Many people in the group left notes and prayed at the Wall. Following our visit, we went for lunch in the old city. 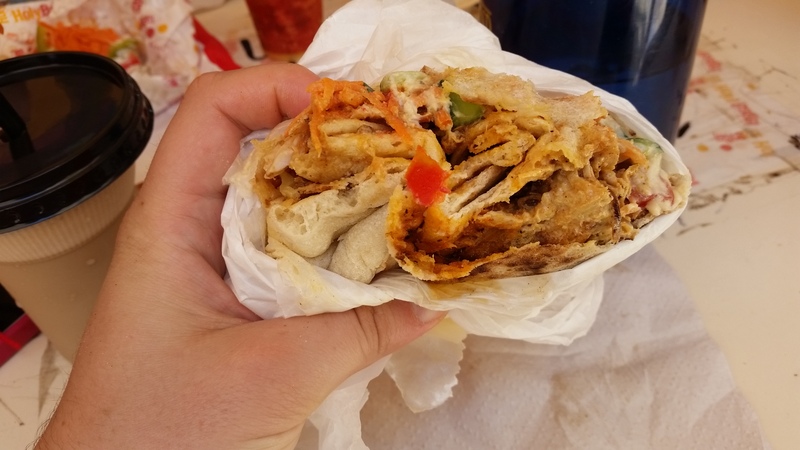 I got another version of shawarma, this time with chicken. After lunch we had a bit more of the history lesson in the old city and then departed for the Bedouin encampment. 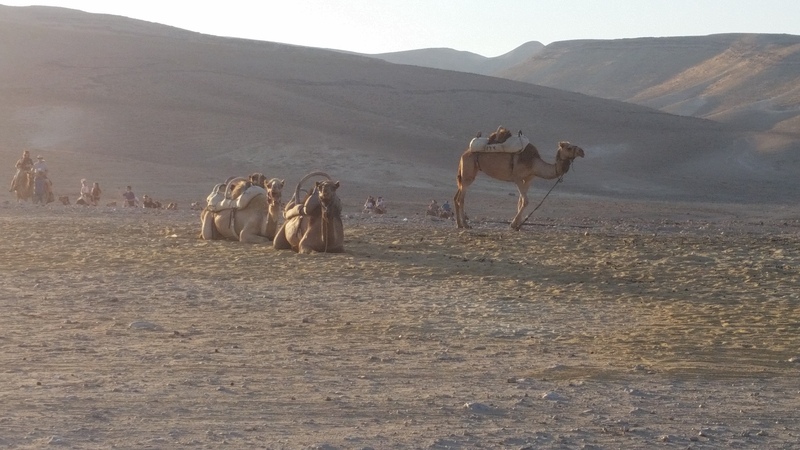 When we reached the Bedouin encampment (which is really a tourist-focused place that exhibits an approximation of old Bedouin life), we rode camels for about 15 minutes. We then went in for dinner. Dinner was “traditional” Bedouin cuisine. 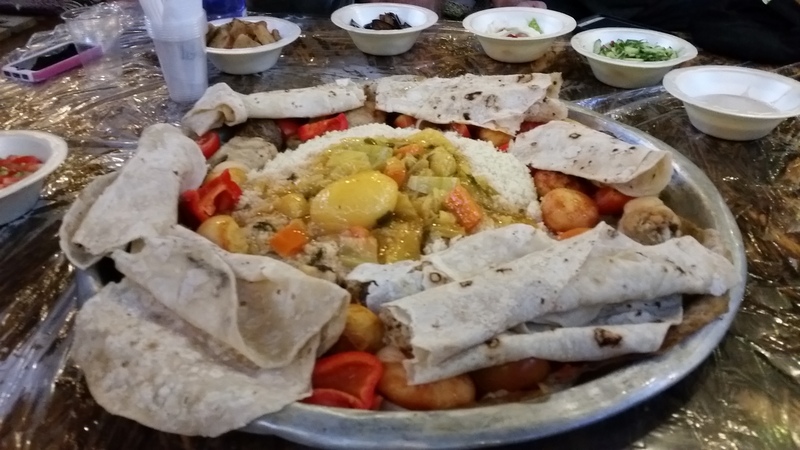 It really reminded me of Ethiopian food, with a giant platter of food on a flat bread and eating without utensils. It was good, but I think the Ethiopian tej bread worked better for this kind of eating than the super thin Bedouin pita. After dinner we had a chance to meet a Bedouin man who told us about his life. It’s very different: a more nomadic, animal driven lifestyle. They also have somewhat different values than is more common in western society: he has three wives and 23 kids (15 boys and 8 girls). We ended the night with a bonfire with the Israelis and prepared to say goodbye to them tomorrow. Breakfast this morning was at 8:30 so we got to sleep in a bit. After breakfast, we left the kibbutz around 9. 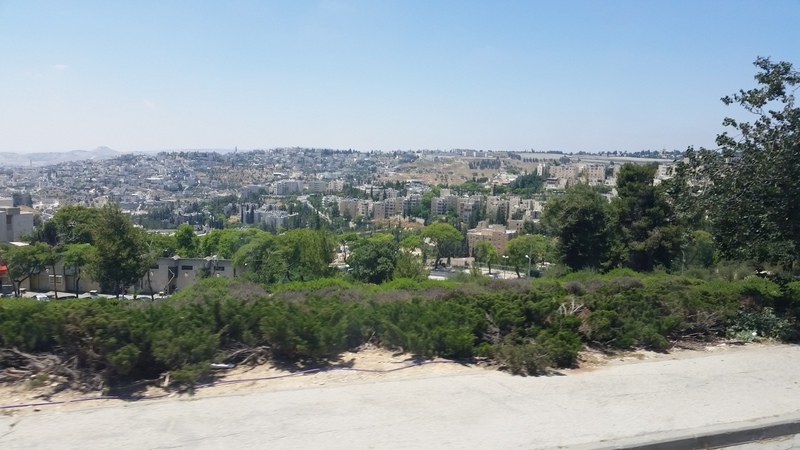 Our first stop of the day was an overlook in Jerusalem where we could see the old city and also the green line (wall, security fence, etc). We had a good talk about how the Temple Mount and Dome of the Rock both got to be in the situation today, then transitioned to a more political discussion about the Palestinian territory. I really appreciated how hard our guide Shai tried to present objectively, in awareness of his own bias. 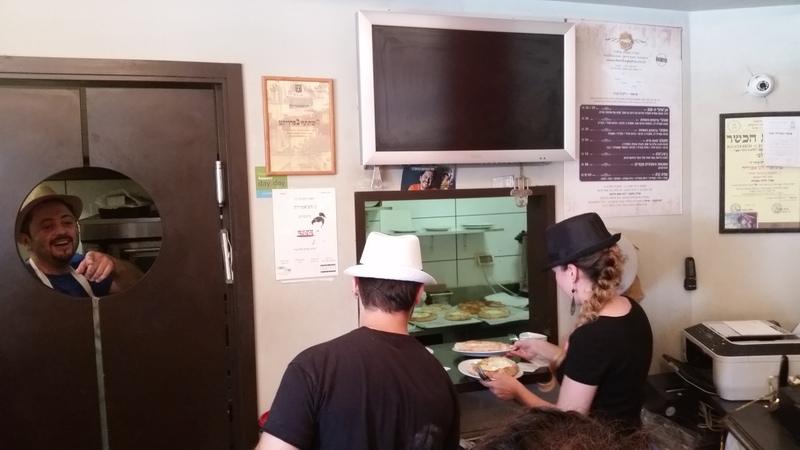 Lunch was on our own at Ben Yehuda street in Jerusalem. I went with a bunch of other people to get better shawarma than yesterday, and it definitely was better. I then wandered around the area for a while until we met back up as a group. 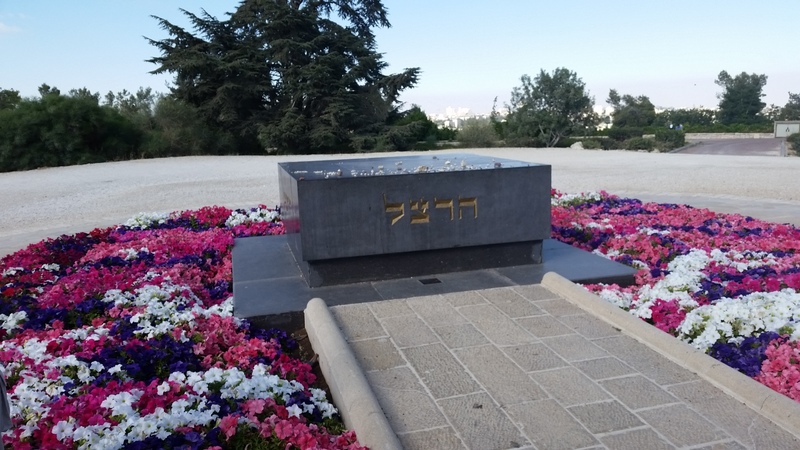 Our final stop in Jerusalem for the day was the cemetery at Mount Herzl. Shai introduced us to the cemetery and tried to help us relate to the people who were buried there. I especially liked the monument to soldiers who died in the war for independence and were the last in their respective families. After Herzl, we came back to Kibbutz Tzuba for dinner and a program led by our Israeli partners. We played a few games and then broke to pack for the next two days: the old city, the Kotel, camels, a Bedouin tent, Masada, and the Dead Sea. Today we left Hakuk Balev. We woke up early enough to load the bus at 7:15 and departed at 8. Our first stop of the day was a nature hike. It was pretty, but not very long or strenuous. We then left for rafting. I was in a group of three and we rated for about 2 hours (getting stuck a lot along the way). We finally got to the end and left for our next activity. 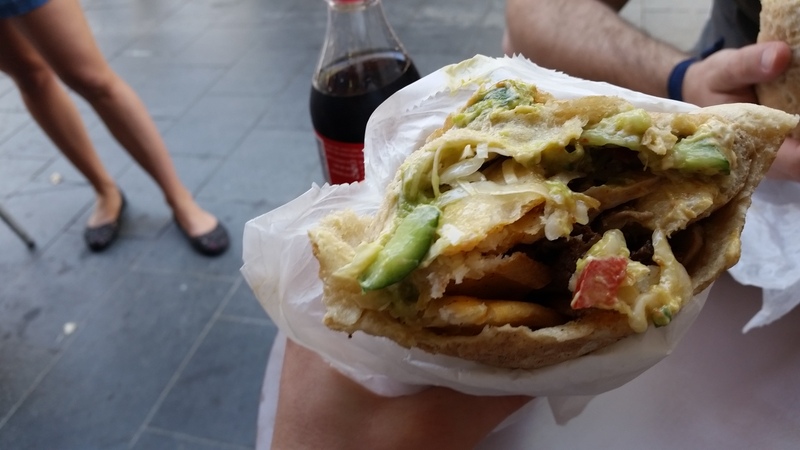 On the way, we stopped for lunch and I had my first shawarma in Israel. It was decent, but I’m definitely looking for more later. 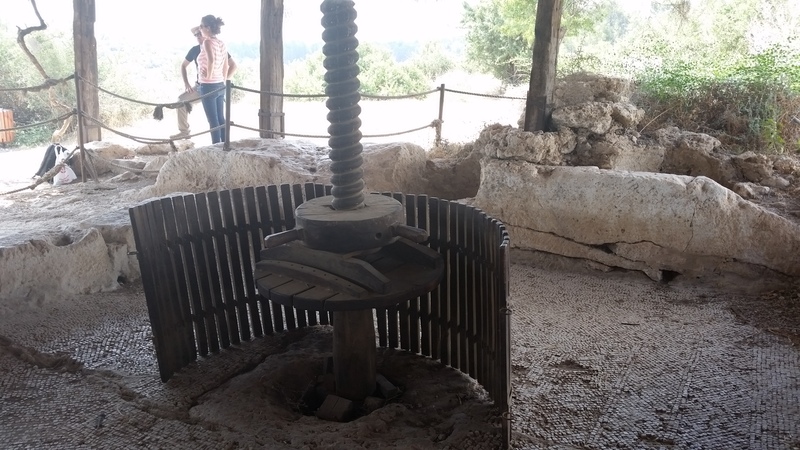 We then went to an olive oil factory and learned how they make both olive oil and cosmetics from the waste olive material. 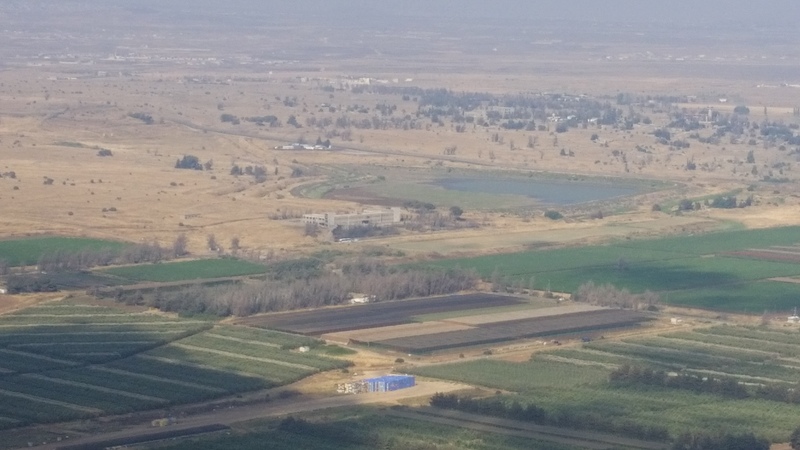 Our last major activity of the day was to go to Mount Bental in the Golan Heights, on the border with Syria. Shai talked to us about the current situation with the various terrorist organizations operating in Syria and the UN mission in the DMZ there. We also got to walk through a bunker at the top of the hill. Our lodging for the night is Kibbutz Tzuba, which I stayed at last time I was in Israel. The fourth day started out a bit earlier in the morning, with breakfast at 8 and departure at 8:40. 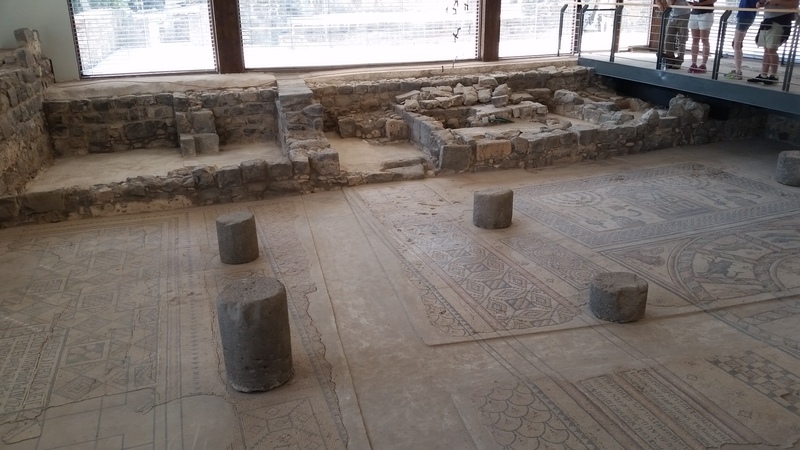 Our first stop of the day was an older area of Tiberias, where we saw the ruins of an old synagogue and talked about anti-semitism. We then drove to a junction to pick up several Israeli students and soldiers. We picked up seven of the eight (one was running very late), and introduced ourselves. My group from the previous night was assigned to meet Tamar, who turned out to be an officer in Intelligence (that was as much as she could say). We took the rest of the bus ride to learn about everyone and then arrived in Tzfat. Tzfat turned out to be really pretty. We got off the bus, took some group pictures, and then made our way up to an area with a bunch of stores for lunch. 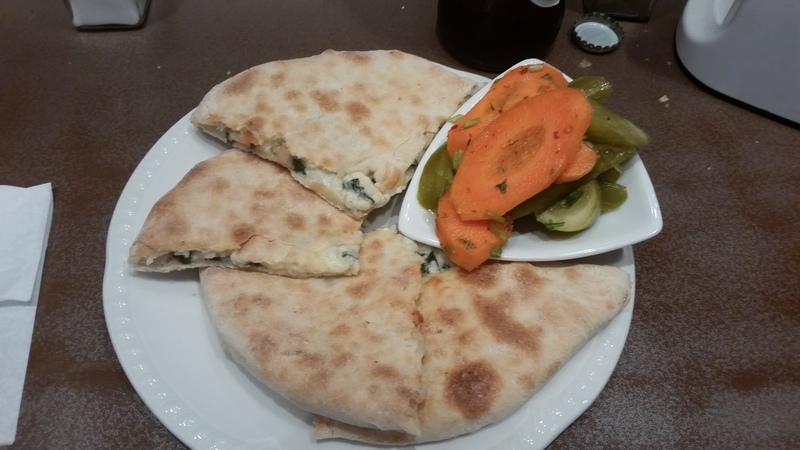 Shai (our tour guide) recommended this Yemenite place, so I went there. 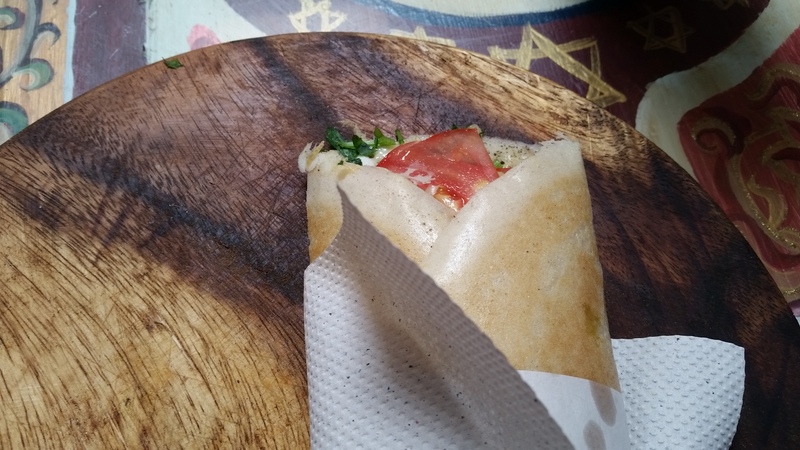 They served this crepe-like thing (though the wrap/bread was thicker) filled with spices, cheese, onions, and tomatoes…delicious! After lunch we met back up with the larger group and went to the home of a Kabbalah-inspired artist. He (the-artist-formerly-known-as-Robert) introduced us to the basic concepts behind Kabbalah and explained a few of his paintings. This was pretty interesting, especially as I had known nothing about Kabbalah previously. We then went outside for an impromptu concert from some of Shai’s musician friends. 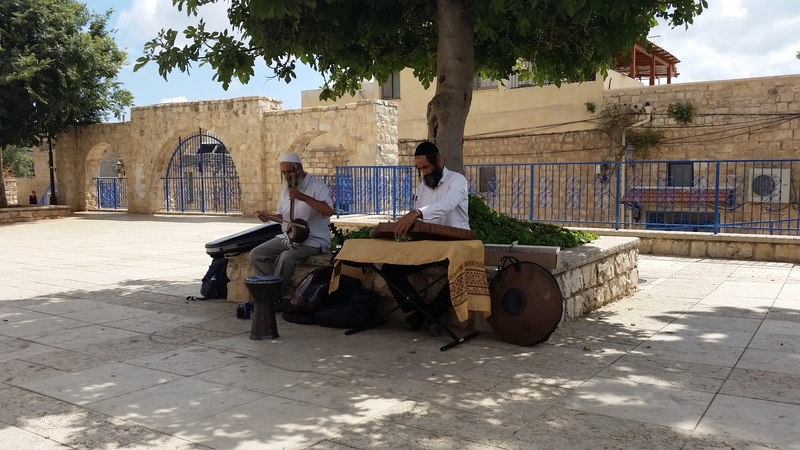 They played with really old instruments, supposedly from biblical times and talked about the history of each instrument. Following the concert, we walked over to a candle factory and got an introduction to candle making. We then went to visit an orthodox Ashkenazi synagogue. The synagogue was pretty inside, though there was a person at the door who was making sure everyone was dressed appropriately. After that, we had some free time to shop and then left Tzfat. In the evening after dinner we had a short program to break the ice with the Israelis. We then ended for the day and I had a nice beer. I’m counting day 2 as starting when we left the airport at 7am local time. 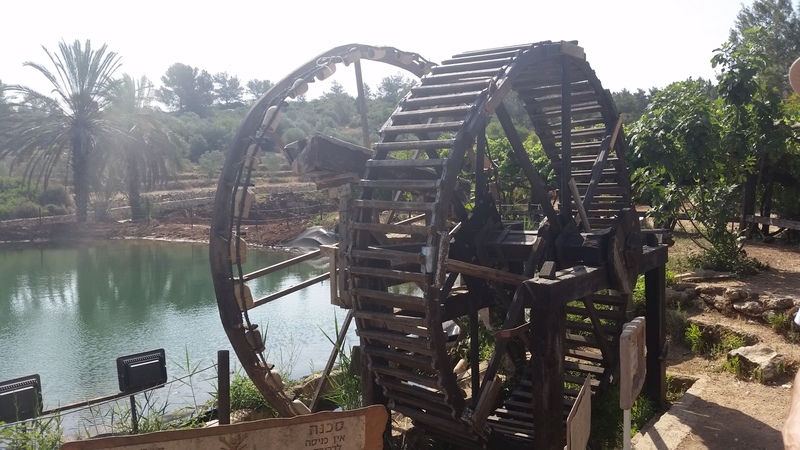 We got on the bus and met our driver, then left on a 20 minute ride to Naot Kedumim, which is a “biblical” nature reserve. Naot Kedumim was pretty cool. The idea seems to be combining archaeological sites and information to present aspects of life around that time. We got to learn about some of the important plants and how they were used, some of the machines, and commentary on what it meant to our tour guide. Following the tour, we left for northern Israel and lunch. We stopped at a mall and I ate at a restaurant called Cafe Cafe. 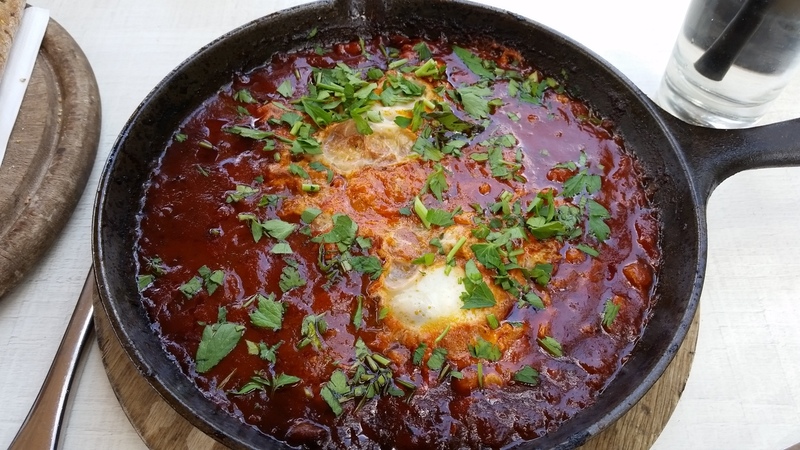 I ordered Shakshuka, which is an Israeli dish I had been wanting to try. It was delicious! Fortunately it looks like something that shouldn’t be too hard to make at home, so I will get to try cooking it once I get back to Seattle. After lunch, we continued to drive and ended up at a kibbutz called Hakuk Balev. I was randomly assigned to a room with two of the other guys on the tour, and got to have my first shower of the trip. Following that delightful experience, I fell asleep and took a nap before Shabbat. Rabbi Emily (one of the Birthright group leaders) led a short Shabbat service outside. When the service was done, we went in the kibbutz dining hall for a dinner of chicken, potatoes, rice, and salad. After dinner, we had a group session where we played some name games and bonding games, talked about safety, and talked about the schedule for tomorrow. When our session was done, that marked the end of the day. We then went to the kibbutz store and it was open for beer. I had a Goldstar dark lager (which was not bad) and socialized for a while. Tomorrow should be a restful day with some Torah study, Jewish identity stuff, and relaxing. 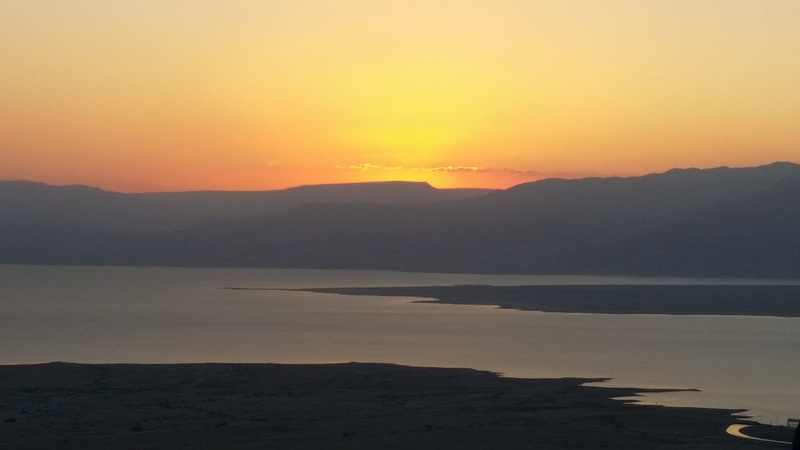 After Havdalah in the evening, we’ll head down to Tiberias and spend some time at the Kineret (Sea of Galilee).